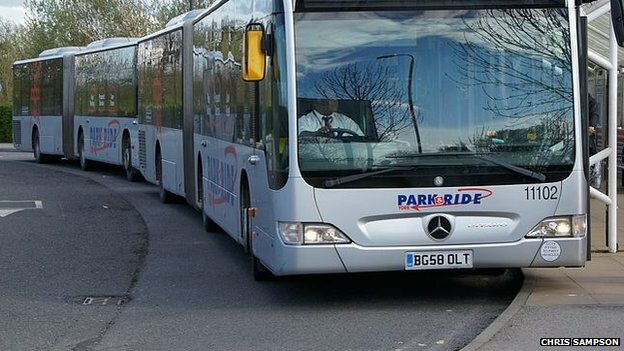 Two new park-and-ride sites in York have opened for use as the city aims to "cut congestion and improve air quality". Electric buses that will be operating from the sites have also been unveiled at Parliament Street in the city centre. The new park-and-ride sites are at Askham Bar and Poppleton Bar. The Poppleton Bar Park & Ride service will become York's first all-electric Park & Ride route. Brand new, locally-manufactured Optare buses will offer a smooth, quiet, zero-emission ride into the city centre. Rapid chargers at Poppleton Bar will keep the buses' batteries topped up throughout the day, and offer electric car owners the chance to recharge too. The spacious new terminal buildings at Askham Bar and Poppleton Bar have been constructed using the latest in energy-efficient design. Making extensive use of natural light, ground-source heating and sustainable wood construction, the new buildings will make a pleasant environment for both passengers and staff. City officials want more people to use the buses to "cut congestion, improve air quality and reduce road accidents". Councillor David Levene, who is responsible for transport issues in York said: "Our aim is to encourage even more people to travel by bus and increase passenger numbers by 18% by 2015. "We know our ongoing work to improve services will help to deliver real benefits for the city and for every £1 spent in York, this project should deliver £4 of benefits by reducing congestion, improving air quality and health, and reducing road accidents." Will Pearson from bus operator First said: "What we would get in peak times of the year would be people coming in to the Askham Bar current site and they would have to turn around because it was full. "That's happened quite a lot and the supervisor feedback has been constant for the last couple of years. "That shows how much business has grown."